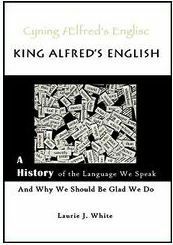 When I first glanced at the book King Alfred's English I thought it would be all about teaching English. It is, but not exactly what I thought. It is a comprehensive history book (170 pages) of how our English language evolved, written as an enjoyable true story. The author's style is engaging, dynamic, and modern. This is nothing like my own high school or college history texts. Beyond history, this is a clear explanation of how our words originated and changed over time to become our modern English language. The kennings and alliteration of Old English poets, for example, were not only explained but demonstrated with line by line translations. The book progresses chronologically. At times small bits of history are shared about specific years, then other times lengthy explanations of key historical characters are shared. "AD 793. In this year fierce, foreboding omens came over the land of Northumbria and wretchedly terrified the people. There were excessive whirlwinds, lightning storms, and fiery dragons were seen flying in the sky. The pdf version is filled with maps and illustrations to clarify the content. Scroll down just a short bit into the student resources below to see an example of the beautiful pictures. Heather and I read this on the Nook for convenience, and most images didn't transfer there, but we were able to refer to the document on my computer to see the pictures. My ninth grader found it interesting, too. From the author: "The language you learn as a small child is the language of your heart. It is the one in which you call out when you are hurt, the one in which you holler when you lose your temper, the one in which you pray. Is English your native language? If it is, then what we are about to study is the language of your heart and the wonderful and sometimes very surprising ways by which it grew to be the crafty, agile, skillful, undaunted, cardio-kleptic language that we speak!" You can read the first chapter online! Resources for the student and the teacher are available free at the author's website http://www.theshorterword.com. This is a book of history the way I wish I would have been taught. I'm happy to be able to share this enjoyable text with my own children. After reading it, I am enjoying going through it again in more depth with the extensive resources. I recommend this book to anyone who wants to enjoy history or better understand the English language. King Alfred’s English in e-book form is available for $5.99 Kindle version or the physical book is available CBD for $14.89. See the table of contents here. We received a download link of this e-book free of charge for the purpose of this review. All opinions are my own. See what other crew members shared in their reviews here.